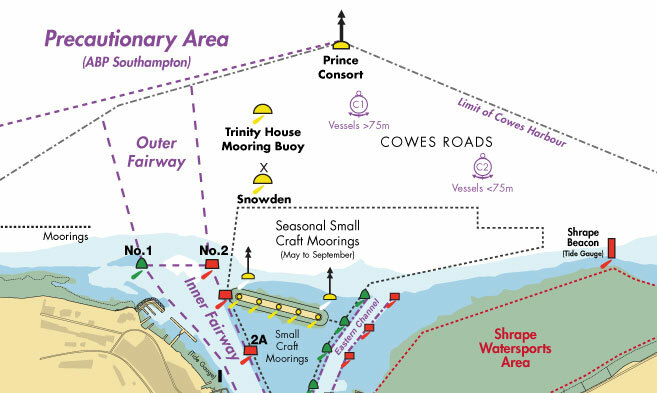 Notice is hereby given that all vessels navigating the approaches to Cowes but within the limits of the Port of Southampton shall ensure that a vessel greater than 220m shall be given a 'clear channel' between the Hook Buoy and the Prince Consort Buoy (Precautionary Area – see fig. 1). The term 'clear channel' is defined, as 'a clear channel vessel is one which requires a clear an unimpeded passage ahead when transiting the Precautionary Area'. 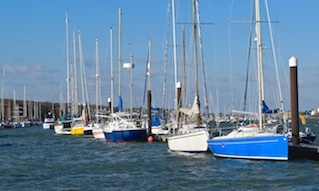 Vessels may enter the Precautionary Area maintaining a safe distance astern of a 'clear channel' vessel. Two vessels each having a length greater than 180 metres shall not pass or overtake each other between the Hook Buoy and a line drawn due south of the West Bramble Buoy. 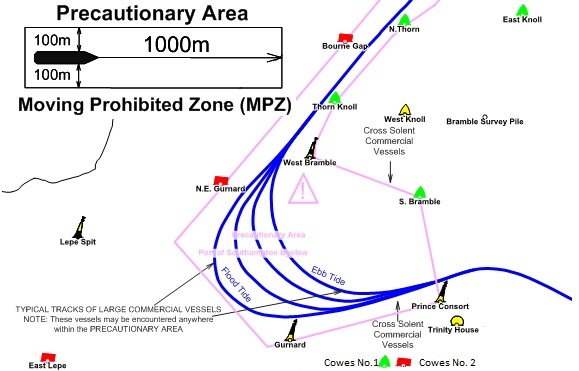 The Southampton Harbour Byelaws enforces the requirement that all vessels over 150 metres in length when navigating in the Precautionary Area referred to in this notice are automatically allocated a Moving Prohibited Zone (MPZ). The MPZ is an area extending 1000 metres ahead and 100 metres either side of any vessel greater than 150 metres within the Precautionary Area. 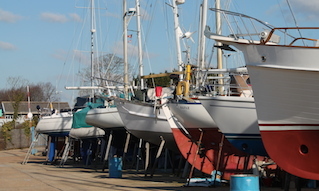 The Master of a small vessel (less than 20 metres in length or a sailing vessel) shall ensure that his vessel does not enter a Moving Prohibited Zone. For the purpose of indicating the presence of the Moving Prohibited Zone the Master of any vessel of over 150 metres length shall display on the vessel where it can be best seen, by day: a black cylinder, and by night: 3 all-round red lights in a vertical line. 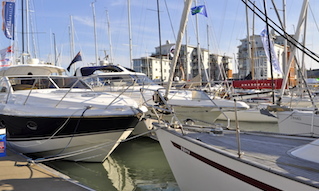 When operationally possible the Southampton Harbour patrol launch (VHF Call Sign 'SP' Channel 12) will precede these vessels within the 'Precautionary Area' showing, in addition to the normal steaming lights a blue fixed light. The absence of the patrol launch will not invalidate the implementation of the moving prohibited zone.